The section of the world's longest pleasure pier which was gutted by fire is to be rebuilt - even though it could cost millions of pounds. The damage to the Southend Pier was a serious blow to the town, said borough council leader Anna Waite. Ms Waite said: "We will be looking to restore it to its former glory. It's a very sad day and the pier will cost millions of pounds to rebuild." A pub, a railway station and other buildings were destroyed in the fire. A full investigation is being carried out into the cause of the fire which started at about 2240 BST on Sunday. About 75 firefighters worked through the night to bring the fire under control. Eyewitnesses said flames leapt 30 to 40 feet in the air as the "absolutely huge" inferno engulfed up to 130ft of the pier and the blaze could be seen for miles. McGinty's pub, a restaurant, shops and toilet facilities collapsed into the Thames Estuary, taking part of the pier's wooden floor with them. The cause of the blaze is not yet known but it is currently being treated as suspicious. This is a routine assessment until it can be ruled out. 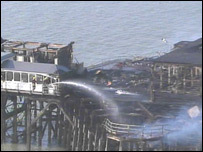 Eyewitness Dave Watts told the BBC News that the main entertainment area of the pier had been "devastated". Mr Watts, a cab driver, said he could see from the shore that the fire was "absolutely huge". There are a number of buildings at the end of the pier, including the pub, fast food restaurants and a newly-built lifeboat station. It is thought the lifeboat station has survived. At 1.34 miles (2.16km), Southend Pier is the longest pleasure pier in the world. It opened in 1889, with extensions added in 1898, 1908 and 1929. It has suffered a number of disasters in the past. In 1959 a major fire destroyed the Pier Pavilion at the shore end of the pier. This was replaced by a ten-pin bowling alley which opened in 1962. The bowling alley was itself destroyed by a fire in 1995. In 1976, the pier suffered another major fire which destroyed much of the area that had opened in 1908. Former Southend MP Sir Teddy Taylor told BBC Five Live: "It's sad because it's one of the great assets we've got in Southend. "It's a great place to walk down, it's a great opportunity for people to enjoy themselves. But sadly it looks as though we're in for a horrible business once again." Got a text from a colleague at 0110 to tell me the pier was alight. Upon looking out of my bedroom window it was clear that the entire seaward train station, arcades, McGinty's pub and Mariotts Restaurant, were well alight. The ominous orange glow reflected across the wet mud and illuminated the thick smoke above it. I spoke to a friend who is skipper of a local cockle boat and they were involved in a search and rescue operation for 4 missing persons. I live in the road above the Pier and although I went to bed at 1am, I heard nothing (the entrance is only 150m away from home). Yesterday I went for a walk down the Pier with family, this being the first time in at least 5 years since it last re-opened following fire. For the sake of local heritage, I think I will stay away when it re-opens again! Such a shame as it was a lovely day out, watching the Waverly steam paddle boat come into dock amongst other things. I was looking forward to walking it again more often in the future. Although under my nose, I am ashamed to say I previously paid little attention to it, possibly because it was taken for granted as I see it everyday. The pier may be the longest pleasure pier in the world but it must also be one of the most neglected. I haven't been up there since before it last burnt down because there was nothing of interest accept the visible damage of the last fire. Does this mean now we can have a real pleasure pier instead of a very distant run down pub. I was looking out my office window and there it was, massive flames and all of that. Scared me a lot, I hope no children got hurt. Just after they had all those safety cameras installed as well! I saw the smoke when the pier caught fire in 1976, I remember laying in the garden wondering what the smoke was, I also saw the fire back in 1995, and remember seeing bowling balls falling into the sea in clouds of steam. I wish that whoever is doing this awful thing would stop, I am proud to come from Southend, and the pier is a major attraction which never quite seems to ever get totally renovated before being on fire again. I did not witness the fire myself, however I would just like to say that having been born and bred and continuing to choose to live in the region I certainly hope that Southend Pier can survive yet another disaster, it is a very special amenity and symbol to the local community and its is especially sad that the new and most important lifeboat station will be affected on such a busy waterway.